Breakfast is one of the most important meals that one needs to have on a daily basis. Starting the day right is essential for growing kids. It is crucial that my kids get the right nutrients into their body at the start of the day so that they can be mentally and psychically alert to face the day. They need all the energy that they can get while satisfying their hunger. Every morning it can a mad rush to get the kids ready for school. There isn’t much time for fancy meals or a wide variety of breakfast items to indulge in. What I can only afford is something simple, nutritious and easy to prepare. 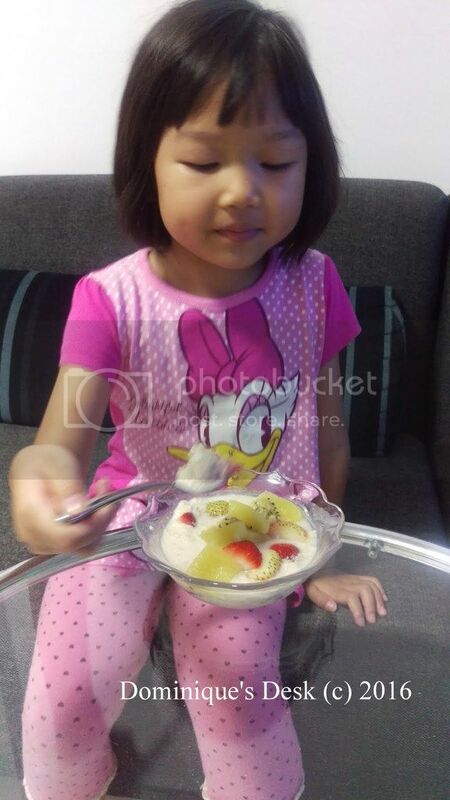 Oats is one of my top choice of breakfast foods for the kids. Oats are a good source of Vitamin B6 which encourages the release of Serotonin, the body’s feel-good hormone. It is very nutritious as it is packed with high amounts of Vitamin B1, B2 and E and minerals such as Phosphorus, Potassium, Manganese and Zinc among others. With a low GL content, Oats can also reduce the chances of heart disease, cholesterol and the probability of birth defects in babies during the 1st trimester. Eating Oats also may help to improve your skin quality as it is used in various beauty treatments. The Oats from Captain Oats come from Australia and goes through OatiFresh™ Process, a heat and moisture treatment to prevent them from going bad while retaining important nutrients. Raw oats are not really edible. Therefore the oats has to be put through a process of cleaning, dehulling, heating, sizing, cutting, flaking and lastly, packing to make them more appetizing for the consumer. There are 3 variety of oats available by Captain Oats. This has the chunkiest texture as, rolled oats look like flat, irregularly round, slightly textured discs. When processed, the whole grains of oats are first steamed to make them soft and pliable, then pressed to flatten them. It is the least processed compared to the Quick cook and instant oats. It is recommended for baked goods like muffins and granola bars. This type of oats has a finer texture compared to Rolled oats . It is partially cooked therefore it has a shorter cooking time. as compared to rolled- cut oats. They too can be used in baked goods like cookies and muffins. This type of oats is pre-cooked. It has a finer texture then quick oats. 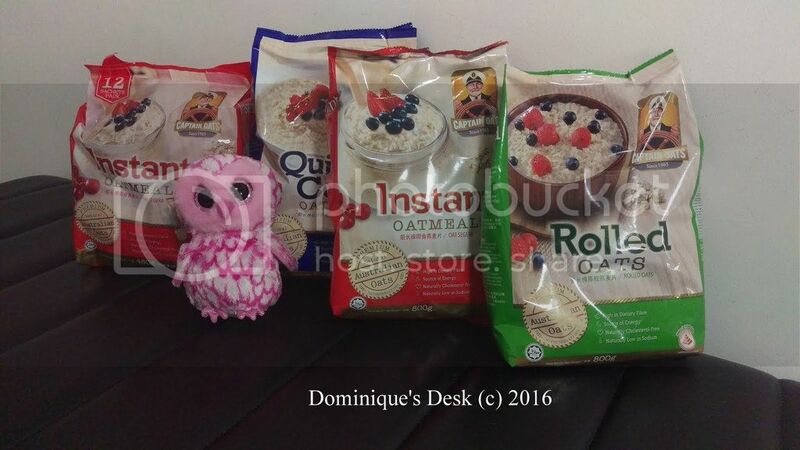 They are the most processed oats among all the varieties available and the most convenient to consume. The types of food which you can make using oats are countless. If you are pressed for ideas you can check out the recipes on Captain Oat’s website. 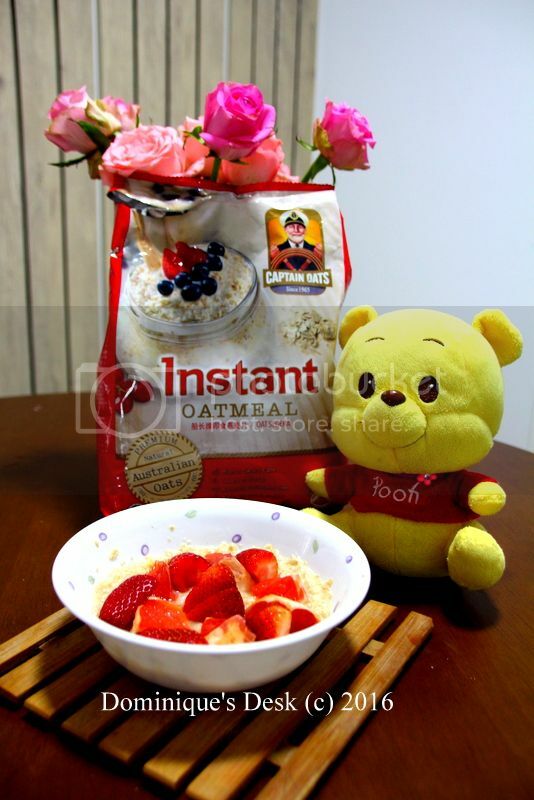 This is one of my favourite variety from Captain Oats- Instant Oats. The oats are really easy to make as you just have to add hot water to cook it instantly. 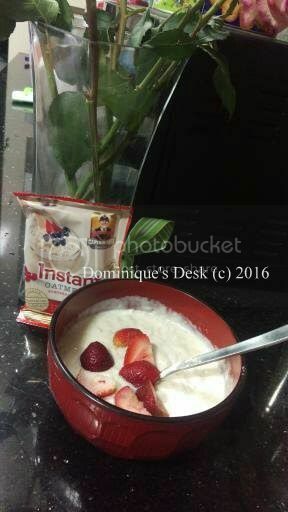 This variety of instant oats also comes in 12 sachets of 40g each which is really good for filling one’s tummy in the office or on the go when one travels overseas. It is extremely convenient way for me to pack to fill the rumbling tummies of the kids when I am pressed for time. I normally add a variety of fruits to the bowl of oats when I serve it to the kids in the morning. They love the sweetness that the fruits add to the oats. 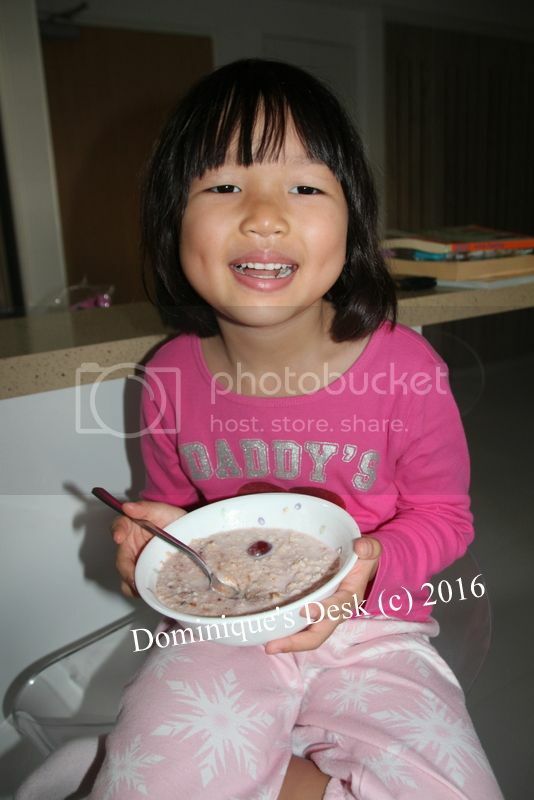 Are your kids eating oats for breakfast too? Disclosure: This is a sponsored collaboration between Captain Oats and Dominique’s Desk. Pictures and opinions are 100% mine.